Shinzo Abe’s successful U.S. visit means increased pressure on Park Geun-hye to repair relations with Japan. Japanese Prime Minister Shinzo Abe’s visit to the United States last week was more than a meet-and-greet amongst allies. It was reaffirmation that Tokyo remains Washington’s most important ally in Asia, if the revision to the U.S.-Japan Defense Guidelines to encompass a broader role for the Japanese Self Defense Forces to offer logistical support to the American military beyond East Asia is anything to go by. That it was also widely seen as a personal and national triumph for the Japanese leader means there will be significant hand-wringing in Seoul, given that its relationship with Tokyo has grown increasingly hostile and dysfunctional over unresolved wartime issues. While genuine historical closure between these two countries is some time away, Abe’s successful American visit also means there will be increased pressure on South Korean President Park Geun-hye to take a more conciliatory and constructive approach to Japan. The reasons behind South Korea’s enmity toward Japan are complex and long-standing, and will not be resolved easily. One should remember that modern Korean nationalism was forged during an era of Japanese colonization of the Korean peninsula early in the previous century. In more recent times, South Koreans accuse the Japanese government and people of being insufficiently sorry for wartime actions such as forcing or else trapping Korean citizens into becoming “comfort women” for Japanese troops. Even though Abe has repeatedly stated that he will uphold all previous official statements by his predecessors (such as the 1995 Murayama Statement, which apologizes for Japan’s wartime history, and the 1993 Kono Statement, which offers an apology for Japan’s use of comfort women specifically), the Park administration insists that Abe must do more to show that he is genuinely remorseful for such history. Whether such a personal assessment is fair, or indeed relevant, given there has been no change to, or retraction of, Japan’s official statements on these matters is open for debate. 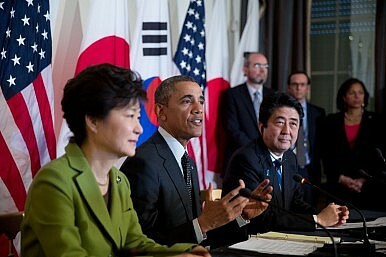 In any event, and for these and other reasons, Park has refused to accept a bilateral meeting with Abe. By way of contrast, the Korean president has conferred with Chinese President Xi Jinping six times since 2013. This is despite the fact that North Korea – a client state and official ally of China’s – remains Seoul’s most serious and intractable strategic and security preoccupation, and Japan has very similar aims and interests to South Korea when it comes to the matter of the Hermit Kingdom. The Park administration will undoubtedly disagree with this and similar assessments. But it cannot deny that the success of the United States’ so-called rebalance to Asia, and more broadly the American-led alliance system in that region, requires the more capable allies to take up more of the security burden. And with arguably the most capable naval and air force of any Asian power, Abe’s expanded view of a more proactive Japan is just what the United States needs. With larger strategic fish to fry, such as counter-balancing Chinese power and managing the North Korean problem, Washington will become increasingly impatient with allies that focus on the past at the expense of addressing current and future challenges. This is particularly the case since other countries also suffered at the hands of Imperial Japan, including Singapore, Malaysia, the Philippines, Vietnam, Indonesia, and Australia. Yet, with America, these countries spent the decades after the war rebuilding relations with Tokyo even as wartime wounds might have still festered in parts of their societies. Having seemingly lost the diplomatic battle with Abe, the political pressure on Park to change tack when it comes to dealing with Japan will rise. Even before Abe’s latest visit to the U.S., it seems that many South Koreans were highly cognizant of the strategic challenges facing their country and were looking to the future rather than the past. According to a 2014 survey by the ASAN Institute for Policy Studies, a prominent South Korean think-tank, almost two-thirds of respondents believed that a closer relationship with Japan is a necessity given China’s rise. Even the political benefits of rebuffing Japan are open to question. In the same survey, almost 58 percent believed that Park needs to take a more proactive role in improving relations with Japan while half of all respondents agreed that a bilateral summit between Park and Abe ought to take place. With numbers like these, perhaps there are soon to be better days ahead for Seoul and Tokyo despite the emotion of this 70th anniversary year of the end of the Pacific War and defeat of Imperial Japan. Dr. John Lee is a senior fellow at the Hudson Institute in Washington, D.C. and an adjunct professor at the Strategic and Defence Studies Centre at the Australian National University in Canberra. South Korea-Japan Comfort Women Agreement: Where Do We Go From Here? Domestic opposition to the deal in South Korea continues to intensify, posing challenges.